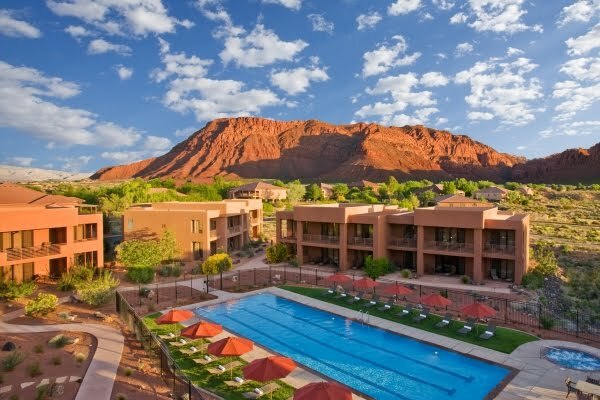 Weighty Matters: Red Mountain Resort - a Healthful Getaway! I get a great many PR pitches. Most get deleted almost instantaneously, but this one caught my eye. It was for a resort in St. George, Utah, called Red Mountain Resort, and while I'm pretty sure they practice some questionable woo with some of their treatments or recommendations (for instance they offer nonsensical "detoxification"), it still looks quite interesting. Sports, hiking, fitness, fancy spa stuff, beautiful accommodations complemented by what appears to be luxurious, yet calorie reduced, dining, where all entrees and desserts are lower than 550 calories. Sadly the PR pitch didn't come with any perks for me to enjoy were I to write about it, but it's an interesting sign of the times that this type of resort is able to thrive. Sure contrasts sharply with the average don't move and eat as much as humanly possible vacation that most of us tend towards.